刘晨, 张文平, 曹贻鹏, 等. 船用柴油机增压器压气机高效工况气动噪声预测[J]. 哈尔滨工程大学学报, 2019, 40(4), 759-766. DOI: 10.11990/jheu.201801065. LIU Chen, ZHANG Wenping, CAO Yipeng, et al. Prediction of marine diesel turbocharger compressor aerodynamic noise at high efficiency operating conditions[J]. Journal of Harbin Engineering University, 2019, 40(4), 759-766. DOI: 10.11990/jheu.201801065. Abstract: The numerical method was applied to predict compressor noise under multiple operating conditions for analysis of aerodynamic noise characteristics of a centrifugal compressor in a marine low-speed diesel engine turbocharger under high-efficiency operating conditions.The time and frequency characteristics of fluctuation pressure at different operating speeds were comparatively analyzed through unsteady flow simulation.The discrete tonal noise and broadband noise of the compressor were then calculated with unsteady fluctuation pressure.Results show that the unsteady fluctuation pressure exhibits strong periodicity, and obvious peaks of pressure amplitude appear in the position of blade-passing frequency and its harmonics after fast Fourier transformation.Furthermore, unsteady fluctuation pressure increases with the increase of speed.The broadband noise spectrum can be determined while obtaining the peak value of discrete tonal noise when the impeller inlet surface is used as a sound source.As the rotating speed increases, the total sound pressure level of aerodynamic noise is enhanced.The compressor noise that radiates from the inlet nozzle exhibits directivity, which varies with frequency and rotating speed change. 李磊, 李元生, 敖良波, 等. 船用大功率柴油机涡轮增压器多学科设计优化[M]. 北京: 科学出版社, 2011: 1-218. 温华兵, 徐文江, 鲍苏宁, 等. 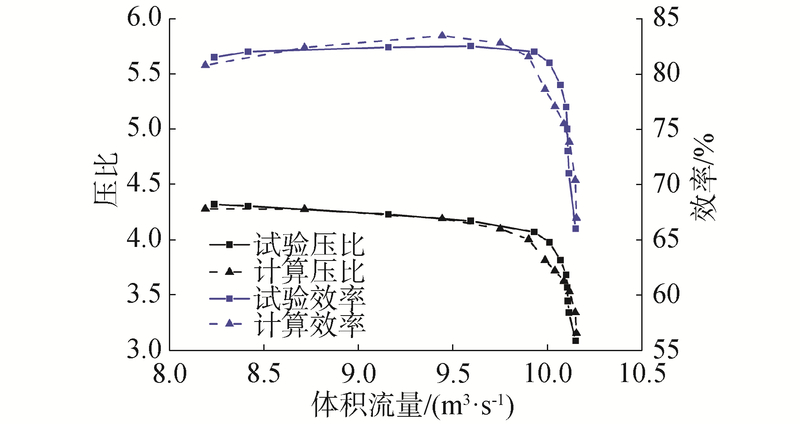 柴油机废气涡轮增压器噪声机理及性能试验研究[J]. 内燃机工程, 2013, 34(1): 76-80.